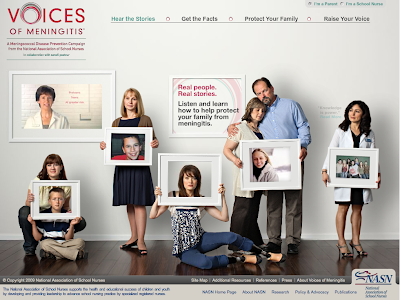 An image I created for Publicis Modem for the Voices of Meningitis website won at the Webby Awards this year. If you haven't seen the image or the website, check it out! The Webby Awards is the leading international award honoring excellence on the Internet. Established in 1996 during the Web's infancy, the Webbys are presented by The International Academy of Digital Arts and Sciences, which includes an Executive 750-member body of leading Web experts, business figures, luminaries, visionaries and creative celebrities, and Associate Members who are former Webby Award Winners and Nominees and other Internet professionals.